Quite a feat to have a script made entirely of exposition dialogue written by a five year old child. Humourless and utterly pointless to the last, don't bother. If you've not seen it, watch 'The Treasure of the Sierra Madre' instead. Nice but feels a bit flat. Not that terrible really. It's a morally murky man-movie beginning as a heist and ending as an Anabasis. Both Chandor and Boal are capable of more than this, but it's well-polished and suspenseful and does what it's supposed to. Lush cinematography and a charismatic cast make this an enjoyable watch. The film was at its best during the tense and brutal set pieces. However, it was let down by a weak ending due to inconsistent character motivations and actions. Still much better than a lot of Netflix films. This film does from time to time stray away from the path you expect it to take. In doing that it does leverage a little bit back in terms of the faulty plan and very one dimensional characters it creates. There was and is a lot more potential within these characters. It was enjoyable but it just never quite makes you reach the level of excitement that other films have despite the talent present to do just that. The action scenes were almost flat and short and the tension just did not mount. Overly familiar riffs and tropes but not completely dull. Awesome cast and story ruined by poor directing. Ben Affleck steals every scene he is in. I really wanted to like this, but why is it that Netflix films always look low-budget, even when they're not? Is it the lack of extras? The use of drone shots instead of crane shots? A lens that's not wide enough? I'm not sure, but something is off with the way this entire movie looks, making it seem like a straight-to-video low budget military themed time-passer. The heist scene is solid though. 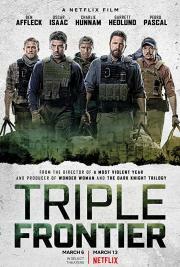 Plays a bit like a weaker version of Lone Survivor with Ben Afflecks character and acting as the film’s weakest spots. But hey - there’s Metallica and Pantera on the soundtrack! And the action works pretty well. Could’ve been better with a tighter script though. There's not much character development here and not much to hold on to. Is it patriotic? Is it not? Who knows really. The heist scene was directed well but the rest of the action was very mediocre with some cutting errors that made a few scenes seem weird. Could've been a deeper film. First half works as a good heist movie, the second part, the escape material, not so much. Some good action scenes and a thrilling sense of suspense keep the plot going. What starts as a middle-aged dad fantasy (the boys are back in town!) turns into a Michael-Mann-lite procedural, and then finally a critique on greed and the American military. There isn’t a lot of meat on the bones, but the film is slick as hell and the cast is very fun to watch. Wish I had seen this in the big screen. Missing some additional element to really justify existing. Has some good tension. Got it? You can kill and steal ONLY for your country, otherwise it's evil and you will die. So, make sure that flag is on your shoulder while doing it. Gerçekten son zamanda izlediğim boş,klişelerle dolu bir aksiyon filmi gibi izlemeye başladım ki yaklaşık ilk 50 dakikası böylede oldu ama öyle bir vurucu sahne var ki filmde resmen şok içinde kaldım oradan sonra gerçekten film kesinlikle ortalamanın üstüne çıkıyor.İyi oyunculuk,harika çatışma sekansları ve çekim açıları ile kaliteli bir yapım olduğunu hissediyor.Netflix'in iyi işlerinden.. Considering the cast and the trailer I really expected action packed thriller out of this. Instead we got some sort of soul questioning quest of 5 ex-special forces guys. Couple good and action packed scenes, but thats it, there is nothing more to this. Not bad, but not good either. Feels rushed and not really on point. sierra madre'de eleştirilen defolara 71 yıl sonra benzeri bir anlatıda utanmazca sahip çıkmak ilginç bir siyasi zaferi gösteriyor. chandor'ın filmografisi ve boal'un kariyeri açısından pek şaşırtıcı değil elbette bu. anlatıya sorunlu yaklaşımı, temel vaadi açısından işleyen kalifiye bir aksiyon filmi olduğunu değiştirmiyor ama denk geldiği siyasi iklim özelinde konuşulunca gelecek haklı göz devirme de filmin beslendiği ideolojiyi doğru çıkarmıyor. Starts out slow with character development that mostly failed to get me invested in its characters, aside from remembering Affleck’s motivation. By the time the plot really starts moving, the pacing is consistent and I was never bored. It’s an interesting film that shows just how greedy one can be when faced with a ton of money. I also found the film relatively unpredictable at times, which was a nice surprise. Expected more from this. It's fine I guess, it has its moments, but there is a whole middle section where it loses all momentum and excitement, but it doesn't have good enough writing to add any emotional depth in those parts. It tries, but it comes across as pretty standard. A shame given the cast.